Chest high-resolution computed tomography (HRCT) of a–c) acute hypersensitivity pneumonitis and d–f) chronic hypersensitivity pneumonitis. Chest HRCT of acute hypersensitivity pneumonitis shows bilateral ground-glass densities with centrilobular micronodular accentuation and minor consolidation. Chest HRCT of chronic hypersensitivity pneumonitis shows bilateral reticular shadowing, traction bronchiectasis and minor mosaic perfusion along with some micronodules. 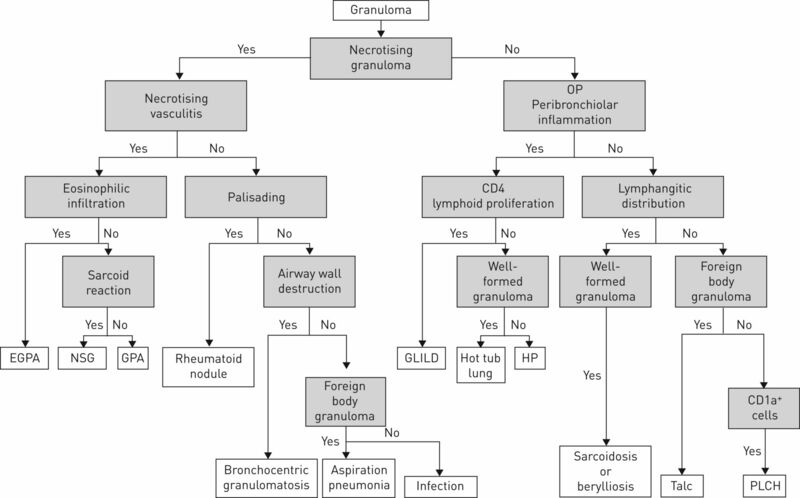 Diagnostic algorithm of granulomatous lung diseases. OP: organising pneumonia; EGPA: eosinophilic granulomatosis with polyangiitis; NSG: necrotising sarcoid granulomatosis; GPA: granulomatosis with polyangiitis; GLILD: granulomatous–lymphocytic interstitial lung disease; HP: hypersensitivity pneumonitis; PLCH: pulmonary Langerhans cell histiocytosis. Reproduced and modified from  with permission from the publisher.